The car charger ensures your Thuraya XT is never out of power while you are on the move. It provides non-stop operation of your handset by charging your Thuraya XT while you drive. The car charger simply plugs into your vehicle’s cigarette lighter socket, charging your handset using a standard vehicle DC jack. Thuraya’s Travel Charger with EU/UK/Chinese plug types is a compact device that links your Thuraya XT to a mains socket for charging. 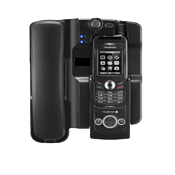 It can be used regardless of whether the handset is switched off, on standby or during a call. The charging time of a Thuraya XT with a fully discharged battery is approximately 2 hours 25 minutes. The exchangeable plugs allow you to charge your Thuraya handset in most parts of the world. The Heavy duty battery can be used to power your Thuraya SO-2510/SG-2520 for extended periods of time. A rechargeable Li-ion external battery pack for charging your internal mobile phone battery. Operating time will depend on network, SIM card setting and your usage style. This charger uses high efficiency solar cells to charge the battery using natural sunlight. Includes a DC jack port for external rapid charging in less than 90 minutes using Thuraya chargers. The solar charger has a built-in LED that turns on when the solar panel is touched by sunlight, and doubles as low battery indicator. The FDU-XT is a home/office docking adapter that allows you to use Thuraya satellite services in indoor environments. Simply connect the FDU-XT with the included antennas and dock your Thuraya XT into the cradle to enjoy all standard satellite based services. Easy to install and operate, it supports Voice, Data and Fax transmission and comes with SAT and GPS antennas with 25m cables to ensure seamless connectivity. A home/office adaptor which enables the use of Thuraya satellite handsets in indoor environments. Compatible with the SO-2510 and SG-2520 models, it complements their design, features and functionality. Simply dock your handset and enjoy all the features including voice, fax, data, GPS and GmPRS via the included 25 meter cable connection to the outdoor antenna. The handset battery will also be charged during docking. The perfect blend of mobility and simplicity, the Thuraya SatSleeve broadens usage of the iPhone. It allows users to make calls and send SMS’s in satellite mode. A dedicated emergency button provides users with instant communications from the most remote locations. With High Penetration Alert, users will be able to receive calls and messages even with the SatSleeve’s antenna retracted. The SatSleeve is also able to prolong the battery life of the iPhone.